Author Mark Leiren-Young speaks with a Saanich resident following his presentation at the RON (Royal Oak Neighbourhood) Talk for Oct. 5. It was Vancouver’s biggest pet, a killer whale caught off Saturna Island. When a pair of men failed to kill the southern resident Orca, they brought the injured animal back to Vancouver. That was 1964, and the killer whale known as Moby Doll went on to lead a revolution in the way humans looked at them. It’s been in Maclean’s Magazine’s top-10 bestseller list for two months in the non-fiction category, and it’s led to a recent National Energy Board pipeline forum in which Leiren-Young spoke on behalf of orcas and the environment. “The NEB admitted a pipeline and increased oil tanker traffic will have an adverse affect on the Southern resident whale population,” Leiren-Young says. It’s generally accepted the pipeline, and additional tanker traffic because of it, will be a death sentence for the 80 remaining Southern resident orcas. Thing is, Leiren-Young was never in it to be an environmentalist. As a kid, Leiren-Young grew up by Okanagan Lake and was obsessed with Sasquatch and the Ogopogo. So, when it came time to do his Grad 8 science project, 13-year-old Leiren-Young called the Society Promoting Environmental Conservation (SPEC) to talk about milfoil. It was his first steps towards journalism. When the science teacher was impressed enough to give Leiren-Young an A for the project, he was hooked. In Grade 9, Leiren-Young did it again, this time contacting John Green, B.C.’s famous Sasquatch expert. At the same time he was enamoured by B.C.’s mythical Ogopogo and Sasquatch, he was also infatuated with Skana, a 1967-captured orca who was purchased, studied, and exhibited by the Vancouver Aquarium. Of course, his love of killer whales didn’t turn into another project until much later. Since then, Leiren-Young has more-or-less retained his love for the Northwest’s biggest creatures, though with a few more phone calls, and a lot more research going into his projects. 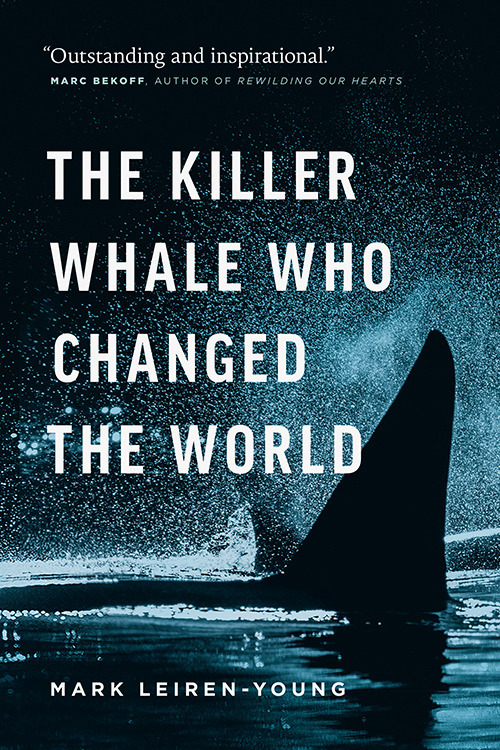 The Killer Whale Who Changed The World is the latest work by Leiren-Young, who relocated to the Gorge-Tillicum neighbourhood when he was named the Southam lecturer at the University of Victoria last year. Initially, Leiren-Young completed a UVic theatre degree and became a successful playwright and former journalist. In recent years he’s won the well-esteemed Jack Webster journalism award for his CBC Ideas radio documentary on Moby Doll. After 20 years Leiren-Young is calling Moby Doll a done project. He initially pitched for years as a magazine story, as a book, and as a documentary, always to no avail, but Leiren-Young has finally moved on. Perhaps not surprisingly, he’s now creating a documentary on Granny, the 105-year-old J-pod matriarch, also a southern resident. What ***The Killer Whale Who Changed The World explains, is how in 1964, public opinion on killer whales was that they were numerous, a dime a dozen, so to speak, and as beastly a creature as there gets in the ocean. It was common knowledge they would eat a human if given the chance. Fishermen regularly fired at them with rifles, and machine guns were mounted on Vancouver Island to defend the shores against the creatures. In short, the whale ended up capturing the imagination of Vancouver, and led to a revolution. Vancouver Aquarium ran the viewings, which continued until the animal died, likely from an infection caused by the harpoon. Because of Moby Doll, people stopped fearing the killer whales and grew to love and respect orcas. What many people don’t realize is orcas is latin for creature of the underworld, and in fact translates to be something much worse than killer whale. The book, which is published in partnership with the David Suzuki Institute, is available in hard cover at book stores and in digital for e-readers, tablets and smart phones. In 2009, Leiren-Young won the Stephen Leacock Medal for Humour for his memoir Never Shoot a Stampede Queen, based on his time as a journalist with the Williams Lake Tribune.